Founded in 1859, Union Cemetery dates back to the years of the early settling of the area, and it was the subject of California's first cemetery legislation. In the 1850's, Redwood City was a growing, unincorporated village dependant upon the lumber trade. A local citizen, who wanted the community's improvised burying ground moved off his property, agreed to contribute matching funds toward land to be used for a new cemetery. In 1859, the newly formed Union Cemetery Association purchased six acres for five hundred dollars. At the same time, the Assembly of the State Legislature passed a bill to authorize the incorporation of Rural Cemetery Associations. This legislation apparently had Union Cemetery as its subject, and was the state's first legislation regarding cemeteries. The exact numbers of burials and headstones is unknown. A review of existing cemetery records indicate between 1700 and 2000 burials. 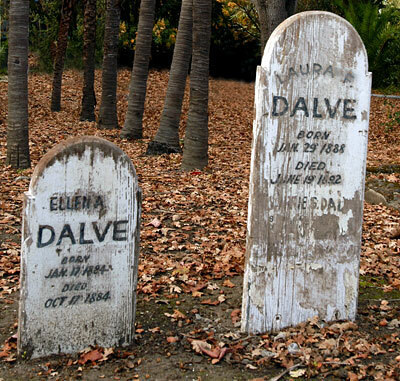 Founders of the local towns of Woodside and Searsville are buried here, along with the "first white child born in Redwood City". Individuals referred to in cemetery records as "Chinaman" and "unknown man found hung" are also interred here, evidencing the cemetery's function on many levels of society. Grave markers are of various materials, including: stone and brick cairns; small and elaborate, though disintegrated, marble paved patios; marble statues; granite slabs; and painted wood markers. Many of the early markers of wood have long since disappeared. Some family plots are enclosed by clipped hedges and other plantings, wrought-iron railings and picket fences. At the original entrance, a plot of approximately 460 square feet was established for the G.A.R. (Union Civil War Veterans). At the intersection of Northern and Western Avenues, the IOOF established a plot of approximately 1400 square feet where a life-sized pot-metal statue of a Civil War soldier was erected in he 1880's. This was the prime feature of the cemetery, and the focal point of Redwood City's Memorial Day ceremony. By 1983 when the cemetery was nominated for the National Register of Historic Places, the statue has been destroyed three times. Vandals demolished it in 1957, after which it was restored. In 1968, on Halloween, it was again destroyed, after which a fund-raising made restoration again possible. Within days of its resurrection, vandals destroyed it a third time. The pieces now reside in the San Mateo County Historical Museum. In 1947, the title was transferred from the Governor's office to the state of California, and in 1962, to the municipality of Redwood City. 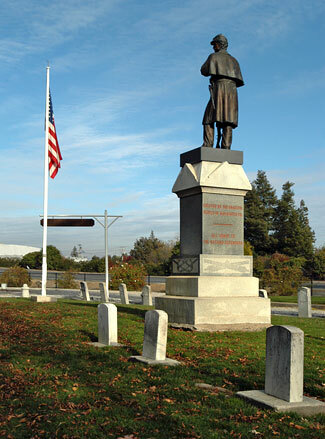 Observances are held every Memorial Day at the cemetery, which was owned by the state from 1859 to 1962 until it was deeded to Redwood City. Flowers are placed on graves and the fraternal group E Clampus Vitus, which is dedicated to preserving California history, holds it unusual "firing of the anvil," an event that dates back to the Gold Rush days. In the firing, one anvil is placed on top of another, a small charge of black powder is placed in between and set off, sending the upper anvil flying. The firing "was used as a primitive, but very effective form of communications in the Goldfields," according to the group's website. "The deafening sound would echo through the remote camps in the hills and canyons, alerting to a mine cave-in, fire, or other danger." Union Cemetery is also California Landmark 816.